Since I had leftover chicken from the mammoth size split chicken breasts I grilled last night, I wanted to be thrifty and use them for my lunch today. I opened the fridge door and perused the shelves to see what I could put together. There was a pint of blueberries that were nearing their shelf life, and an almost empty tub of sour cream. 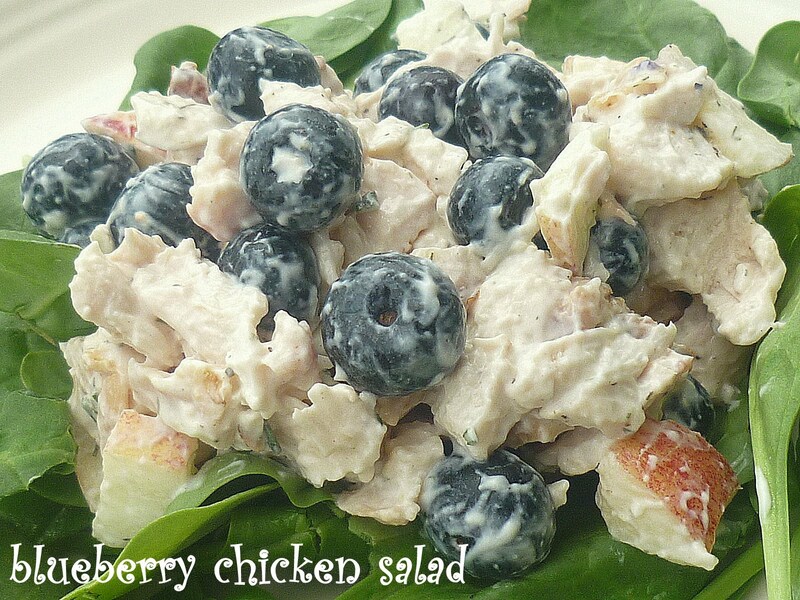 I decided to do some experimenting and came up with this blueberry chicken salad. I was pleasantly surprised that all of the flavors went well together, and other than almost choking on a piece of bone that got mixed in with the chicken...it was a yummy lunch. Some of the measurements are approximations, since I did a lot of throwing in a little of this and that, but it's pretty close. You can adjust things to suit your own tastes. Next time I'll add some toasted pecans or walnuts and a little celery for added crunch, but I was short on ingredients today so I had to work with what I had. Place chicken, blueberries, and apples in a medium sized bowl. In a separate bowl combine sour cream, mayonnaise, lemon juice, rosemary, dill, salt and pepper. Add some of the sour cream mixture to your chicken, until you reach your desired consistency. Gently toss together. I don't like too much mayonnaise in my chicken salad, so I only used about half of the sour cream/mayonnaise mixture. Alternately, you could use another cup of chicken to use up the rest of the sauce. Serve on a bed of spinach or make into a tasty sandwich. Enjoy!